The Qaujigiartiit Health Research Centre is an independent, non-profit community research institute that was founded in 2006 by Nunavummiut, for Nunavummiut, to answer the health questions of our communities. It was founded in 2006 by Gwen Healey Akearok and the late Andrew Tagak Sr.. The centre initially grew out of a climate of research taking place in Nunavut communities that did not focus on the topics of priority interest to Nunavummiut. We focus our research on the priority issues of our communities in a way that harnesses our strengths and builds on our knowledge. Qaujigiartiit has grown from a small volunteer operation to a fully staffed office in Iqaluit with 7 full-time researchers and 10-15 part-time and freelance staff at any given time. The Qaujigiartiit Health Research Centre is an independent, community-led research centre driven by a multi-disciplinary board representing Inuit organizations, research, government and community. The Centre is located in Iqaluit with projects and staff throughout the Territory. We are Nunavummiut working to advance the health of our fellow community members. Our mandate is to is to enable community wellness research to be conducted locally, by northerners, and with communities in a supportive, safe, culturally-sensitive and ethical environment. We promote Inuit Qaujimajatuqangit (Inuit knowledge) and western science ways of knowing and understanding health and wellness in Nunavut concerns about community wellness, healthy environments, and the well-being of Nunavummiut. The vision for Qaujigiartiit is to use research as a tool for action to address health inequities in our communities. Vision. Our vision is for happy, healthy, engaged Arctic communities. Mission. Our mission is to enable health research to be conducted locally, by northerners, and with communities in a safe, supportive, culturally-sensitive and ethical environment as well as promote the inclusion of Inuit and Western epistemologies and methodologies (ways of knowing and doing) in addressing health concerns, creating healthy environments, and improving the health of Nunavummiut. The Qaujigiartiit Health Research Centre has brought over $20 million in research and training funding into Nunavut since its inception in 2006 for the purposes of training Nunavummiut and answering the research questions posed by communities. More than 1000 Nunavummiut have participated in or led our training workshops, pilot projects, research projects, and student initiatives. We have developed, piloted and implemented research projects that have brought new and innovative programming to elders, parents, and youth in our communities. 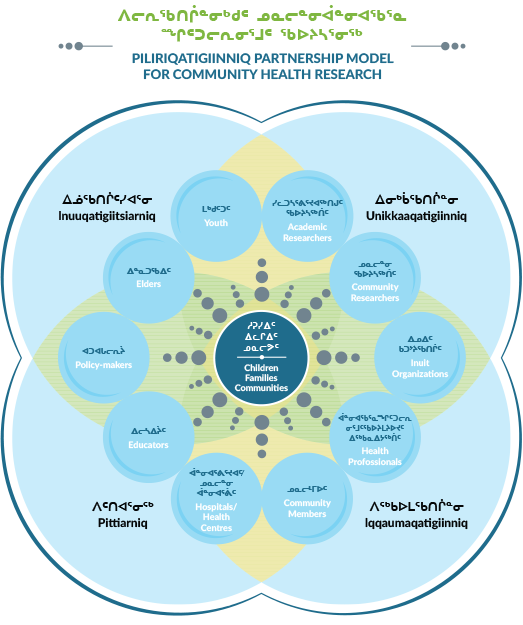 We have created an evidence-base for health-related decision-making that has been used by at the Government of Nunavut and materials and approaches that are now being used in Nunavut schools. Our research projects are flagship projects for the Public Health Agency of Canada and are recognized by the Canadian Institutes of Health Research. Our centre is recognized as a leading northern research centre in Canada and in the Circumpolar world. Our work is published at national and international conferences and in peer-reviewed publications. Our content is published in university textbooks, helping to train the next generation of Canadian and Arctic researchers and health professionals. We apply for and win competitive research grants against Canada’s leading researchers and universities. The Qaujigiartiit Health Research Centre is a strong entity that is making a recognizable positive contribution to the lives of Nunavummiut. See our 10-year strategic plan to learn more about where we are going into the future!